How Do You Get 350BHP from a 1.6? - Page 3 - Miata Turbo Forum - Boost cars, acquire cats. How Do You Get 350BHP from a 1.6? those numbers do seem pretty weak... maybe some one could give a tip or 2 on smoothing things out? do you have a data log? No I don't have a data log. The turbo is just a journal bearing t28. It won't be anything good but that's about all I know. Is there anyone with a similar spec to me that could post there ignition, fuel,afr table etc. If so I will copy them details have a run and see what it's like. On another issue. Why do people put a newer head on like a 99 head? Larger valves or something like that? Far better inlet port shape, this means much better flow and more power for the same boost level, or the same amount of power at lower boost. But it's a 1.8 modification, the 1.6 heads MK1 -> MK2 are the same port wise IIRC. Yes I'm on nutz. I put a post on there ages ago about ms tuners in the north east. I would drive to south Yorkshire if it meant getting a good job done and going an extra 100 bhp. Darlington to yorkshire.. You poms crack me up. Not having a go, we just have a different perspective. In australia its totally normal to do a trip from where I am, in newcastle, to Goulborn and back for a track day, and that trip is about the same distance as the whole way across the uk at its widest part. Umm yeah, but a quick Google showed me that your fuel costs at least 1/2 as much per litre..
Would you still do those journeys if the fuel cost was double? Im on E85 with monster cams and get 6km/L..
Any suggestion on what sorts of ignition and fuel tables I should have as a good bench mark. If this map was the result of "tuning", there is something terribly wrong here. Lemme see if I can find an example of a conservative ignition basemap, so you can see how bizarre yours is. Dont even worry about the 100+kPa part, just look how youre running in vacuum. Its gotta feel horrible. Look through the DIYautotune database and find a map that's close to your setup. Also IIRC I had a thread or two about spark tuning where some people posted their ignition tables, search around for that. For what its worth: your timing at peak boost is pretty much the norm: 13-15* on pump gas at that pressure and size turbo is about right. Its the rest of the map looking like an epileptic seizure that we were disgusted with. Although now that I look at it, even at peak boost your retarded tuner did basically the opposite of common sense: he bumped it up at peak pressure and dumbed it down up top. Normally you want to run a little less ignition on boost onset and peak and taper up towards redline where there's lower chances of det. So smoothing it out probably wont gain you the power you're lacking, just improve how the car runs otherwise. As for your power loss, I'm still really puzzled at why its so bad. At best you're seeing 15psi at redline - better boost control would help a lot. Looking at the graphs, you're either using a crap EBC or a hotside-sourced MBC. Switch to a good EBC valve/controller or a colside-sourced MBC. Very low torque at low RPM. Like, REALLY low. 180ft.lbs at 4k is pathetic, especially for an ARtech setup. Is it an eBay T25? 11.0:1 is too rich across the board. There are sections where it's dipping down to 10.8:1. Way too rich, and the tuner should have figured this out. There's 10whp in the fuel map alone. Post the MSQ so we can see the timing map. Assuming the turbo is chinese, there's probably about 50whp to be found in your setup between better boost control and spark/fuel tuning, but beyond that you need to switch to a genuine Garrett or Borg unit. falcon is correct - 300whp from a 1.6 is a 2871R at around 20psi on pump gas. I think I will make it on a greddy 15g @19-20psi . I will probably be running on borrowed time with my stock 150k mile motor though. Some reasons you are down on power, does the dyno read low? whats the compression look like? do you still have a cat on your exhuast? did you say you have cops or still rocking the stock ignition? Not sure on the dyno. Compression appears fine but I havent checked it. No there isnt a Cat, Cops have just been installed and where not in when the dyno run was done. 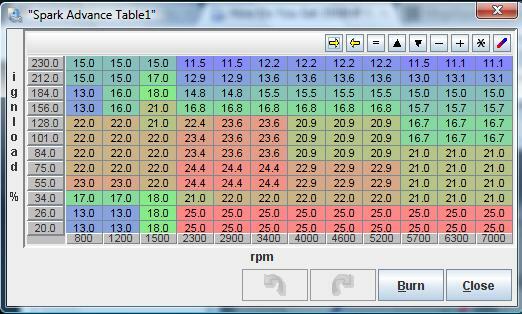 Also worth noteing is the car was hitting the boost limiter at some stages. The guy was monitoring the engine and as he tuned it he leaned it out as it was running very rich. Then he said it was pinking so he took off some timing and so on. I think all he did was get an average amount of performance from it and left the map looking all over the place instead of flowing across the graph like the above tables. It does run ok but has alittle miss fire at certain revs (That was before COPS). There are a few differences with the maps above will they be safe to use? 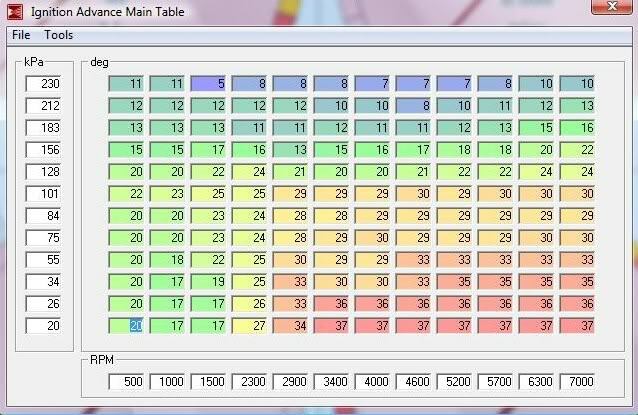 I take it the entire fuel map will also need changing to match the ignition table? I wasnt confident to do the tuning myself thats why I payed the man who robbed me. I can easily replicate the tables above but im worried I may get it running to lean and blow the engine up. I have an AFR but no knock sensor so detecting how the engine is running isnt easy. Or just make some Detcans, a piece of copper tube, flatten one end and drill a hole through it. Put some hosepipe on the other and then run that to a set of ear defenders. If you want stereo, use a splitter to send the pipe to both ears. What intercooler are you using? For now I would try taking one of the above maps and make the vacuum part of your map look like it. You may have to play with idle a little bit but I can guarantee that you will be amazed how much better the car drives while cruising and accelerating lightly. What are your AFRs like when cruising btw? Like I said before you cant be very lean with timing like that without it bucking and such. With that timing map you should be able to tune for significantly better fuel economy. If it was my car I'd just take the numbers under 100kpa and plugged them in from either of these maps. Running autotuner from megalog on a few days worth of logs to correct your wacky fuel map would probably get you close enough for jazz. You do have a wideband right? Quick Reply: How Do You Get 350BHP from a 1.6?